"Her would haves are our possibilities..."
Off late, I do not go a night without watching a documentary on the Holocaust. My interest in that important and unforgettable part of mankind's history piqued when I stumbled upon an interview between Oprah Winfrey and Auschwitz survivor Elie Wiesel. The manner in which innocent Jew men, women and children were massacred during the Second World War, gives me goosebumps. The world knew what was happening inside the concentration camps but no one did anything, everyone watched silently - this is something Holocaust survivors speak of in their documented interviews. Wiesel's book 'Night' published in 1960 is his first person account as a Holocaust survivor and is a must-read. One of the most remarkable accounts of those dark years came from Anne Frank. She took to her red and white checkered diary to vent out her irritations and feelings during her years in hiding in Amsterdam. Her diary which she referred to lovingly as Kitty became her best friend and then became one of the most seminal reads of the 20th century. 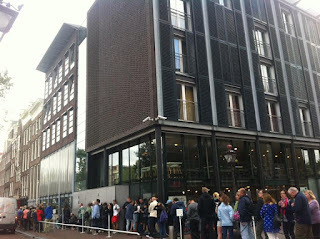 On my recent trip to Amsterdam, visiting the famous Anne Frank Huis museum ranked very high on my list of must-dos. 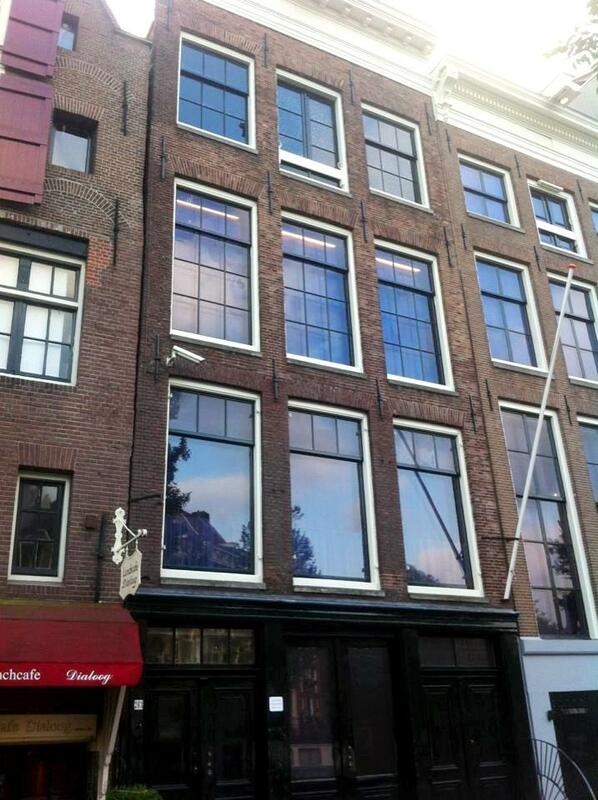 The hotel I stayed at (Andaz Prinsengracht) was along Prinsengracht centrum, the same street as the Anne Frank Huis, the building that Anne Frank and her family hid in. I read the Diary of A Young Girl and watched the two-part mini series on television when I was in school. While reading and watching did bring you close to understanding her circumstances, walking through the Achterhuis a.k.a. the Secret Annex (the hiding place) in the Anne Frank Huis was a whole different experience. 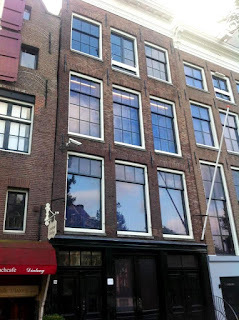 The Secret Annex referred to the living quarters created for the Frank family (and later four more members: three members of the van Pelses family and Dr. Fritz Pfeffer, a dentist and family friend) in the office building of Opekta (Otto Frank's company that made pectin, a gelling agent used in jams). At the onset of the German occupation of Netherlands, the Frank family was forced to abandon their house and move into the Secret Annex where they lived in constant fear of discovery between 1942 and 1944. The Secret Annex was rather spacious for a hiding place with a kitchen, bathroom, living room, two bedrooms and an attic. I began my tour into the Opekta premises and walked past the bookcase that was built to conceal the entrance to the Secret Annex. As I moved from one space to the other, a female audio voice read out relevant excerpts from Anne's diary to recreate the days and nights the Franks spent there in hiding. I learnt of how the residents could only tip-toe during the day so that the warehouse men working in Opekta below did not know about the family's existence on the floor above; they could only whisper to one another and not speak, and had to flush the toilet as little as possible. There was only one bathroom that was shared between eight people and to each of them the bathroom was their only place of privacy. With the very interactive audio-visual presentations, as museum visitors we were regaled with incidents from Anne's diary highlighting that tensions would run high amongst the family members and quarrels would often ensue. Perhaps the most important part of the Annex was Anne's 13ft x 6ft bedroom - a constricted space for a free-spirited young girl like her. I felt the wooden desk where she spent time writing her diary and studying. Her bedroom walls still had faded stickers and posters put up by Anne to bring some cheer into her bare room. The collection included an Opekta ad cut out and black and white pictures of a German Countess, film stars and the British Royal Family. Anne had to share her bedroom with Dr. Pfeffer whom she despised. It is strange to think that the Frank parents let a grown man share that little room with their teenage daughter. We were shown an interview with Pfeffer's son who spoke of his father's personality and his views on the tension between his father and Anne. A novel by Dickens that Otto had read is also preserved and is on display. We watched a screening of Otto's interview where he recounts his painful return to the Secret Annex post the liberation of Auschwitz and his finding, reading and publishing of Anne's diary. Something that Otto Frank said stuck with me - "For me, it was a revelation. There, was revealed a completely different Anne to the child that I had lost. I had no idea of the depths of her thoughts and feelings." Through the audio guide we learn of Anne's dreams of becoming a journalist and of her hopes of her diary getting published some day. Showing some semblance of a normal family life was a wall where there were visible pencil markings by Otto marking the changing heights of his daughters Anne and her older sister Margot. The more mature and well-mannered Margot had studied Latin through correspondence and one of her hand-written lessons is on display. The restoration work of the Annex is so well done - through the re-furnished living room, kitchen and bathroom, one gets transported back into the 1940s. Every window I passed stayed covered leaving one feeling a sense of claustrophobia. The sound of the church bell from the nearby 16th century Westerkerk church travel into the Secret Annex and you can't help but think of how confined Anne must have felt from the outside world. Anne's original diary and the sheaf of papers she wrote on are well-preserved and encased in glass for public display. There is a lovely installation with different copies of 'Diary of a Young Girl' published in different countries in local languages. The last section of the museum is a souvenir shop - apart from postcards and posters you can take back a replica of Anne's red and white checkered diary and a graphic novel edition of the Diary of a Young Girl. Photography inside the house is permitted and understandably so. Museum tickets are available for sale online but they are mostly sold out months in advance. You are then left with the option of standing in a long daunting queue snaking through Prinsengracht Centrum. I read some TripAdvisor reviews where people had to stand for close to 3 hours in the queue. So a word of advice - make this the first thing you do on a given day in the city and queue up outside the museum by 8AM sharp (the museum opens at 9AM). Open daily, the museum is one of Amsterdam's most popular tourist hot-spots. 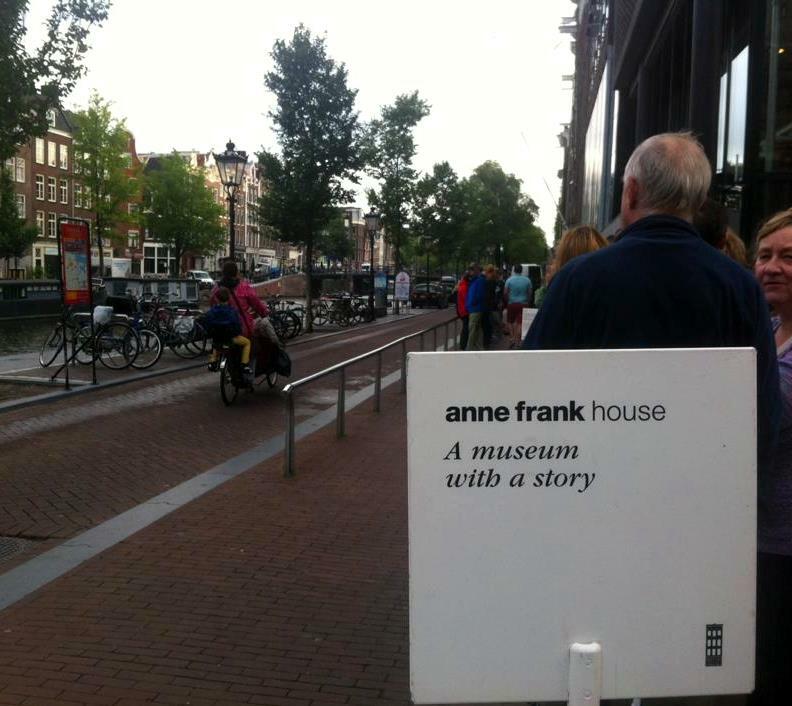 At any given time of day, you will find people taking pictures in front of the Anne Frank Huis. 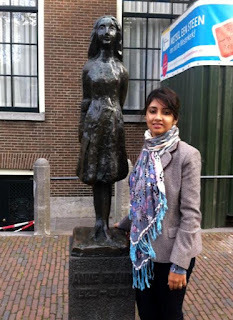 But don't miss the beautiful statue of Anne Frank by Mari Andriessen outside the Westerkerk. 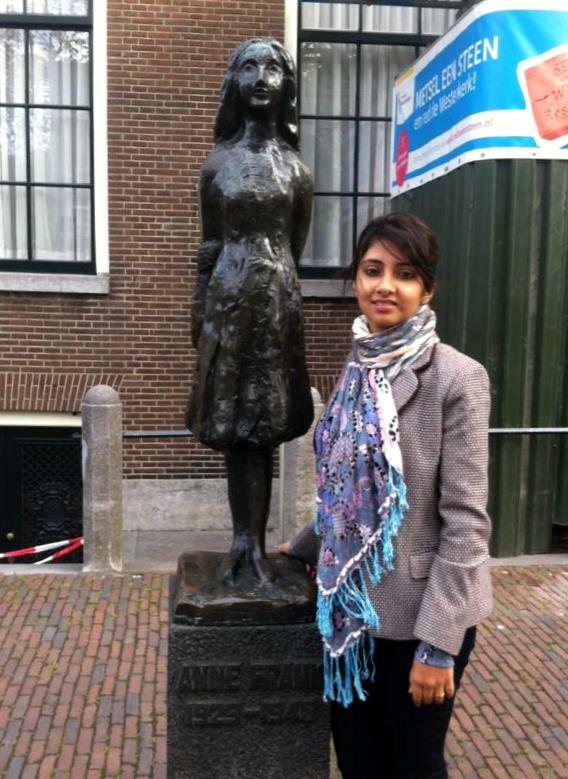 Andriessen was a Dutch sculptor known for his work commemorating the Holocaust victims.